BERKELEY, California, Mar 28 2013 (IPS) - Rodrigo Javier Diaz Guzman was a fairly typical Berkeley, California kid. He loved playing baseball and video games, enjoyed school and got good grades, watched Ninjago on TV, and ate take-out burritos and Chinese food whenever he could. His mother was one of those parents who always showed up at school with snacks for field trips and came along to help if she could get away from work. In school we are learning about all these important people like Martin Luther King and Rosa Parks who fought for people's civil rights and freedom. So what about Rodrigo's freedom? But today, the Mexico-born nine-year old who came to Berkeley with his parents when he was not quite two can’t come home at all. On a stop-over in Houston, Texas, on their way home from a Christmas trip to see relatives in Mexico, airport immigration officials interrogated the father for hours and determined that the family’s visas had expired. They sent them back to Mexico, saying they could not reapply for visas for five years. Unwittingly, the children thrust Rodrigo and his family onto the stage of a raging national debate on immigration reform. “The law isn’t fair and Rodrigo should be able to come back to his classmates and his friends,” Rodrigo’s classmate, nine-year-old Aminah Diaby, said. The campaign to bring Rodrigo home got press attention when the local school board and city council each voted unanimously to ask congress and the president to support the family’s return. Rep. Barbara Lee, representing the Berkeley-Oakland area and among the most pro-immigration-reform members of congress, invited a few of Rodrigo’s classmates to a private meeting with her before a Mar. 26 community-wide immigration forum at St. Elizabeth’s Catholic School, located in the heart of Oakland’s Latino community. 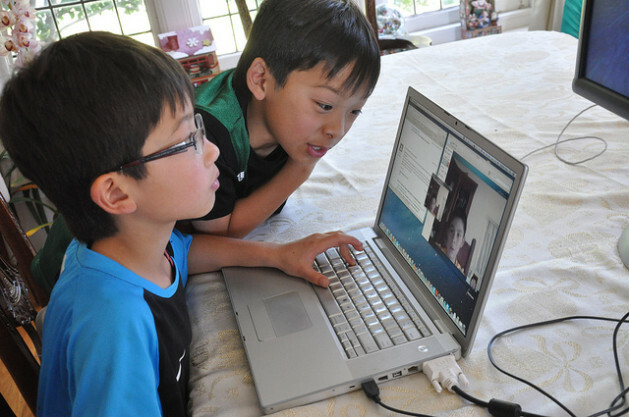 With parental help, the children brought Rodrigo himself via video Skype to meet Lee in a classroom next to the auditorium where the forum was to take place. “Can you please help get me and my parents get back home, back to Berkeley?” Rodrigo asked the congresswoman. Rodrigo and his parents are just three among 11 million people in the U.S. without legal status. At the forum that followed Lee’s meeting with the children, sponsored by the PICO National Network’s Campaign for Citizenship, “undocumented” people lined up to urge Lee to take their stories to Congress. She talked about her dying mother in Mexico, whom she cannot visit, due to her immigration status. “This is a road filled with pain,” she said. The forum, attended by more than 300 people, demonstrated the breadth of those involved in advocating immigration reform. Labour unions were also represented. “A high percentage of our union members are immigrants,” said Josie Camacho, executive secretary-treasurer of the Alameda County Central Labour Council. Camacho expressed concern for non-union immigrant workers, who are subject to exploitation by their bosses, sometimes not paid at all, or paid less than minimum wage. “Employers know they won’t report them as a result of people being afraid about their status,” Camacho said, arguing that immigration reform would help end the exploitation of immigrant workers. Washington lawmakers are deep in discussions about immigration reform, though no legislation has been written. Given their losses in the 2012 election, Republicans – many opposed to immigration reform in the past – appear to be leaning toward support of a law that would regularise the status of people without valid permission to be in the U.S.
At this point, it’s unclear what the legislation will look like. While many in congress talk about “a path to citizenship,” they differ on who gets to walk that path. Some conditions are likely to be a clean criminal record, paying back taxes and speaking English. Some lawmakers want to allow LGBT (lesbian gay bisexual transgender) couples to be considered as families for the purpose of immigration. Some want to issue temporary worker status for certain “low skill” jobs. Some want to increase the number of visas available to university graduates with hi-tech skills. Many advocate increasing security with the U.S.-Mexican border so that new undocumented immigrants won’t follow those already in the U.S.
It’s unclear how Rodrigo’s family, currently barred from U.S. soil, will fit into any eventual reform. Immigration reform “basically lays out important values for California and the nation,” said Reshma Shamasunder, executive director of the California Immigrant Policy Center. “It will determine the fate of millions of people like Rodrigo’s family. It’s being written right now. Our policy-makers need to be made aware that they must consider the painful realities of people like Rodrigo and others,” she told IPS. The children campaigning for Rodrigo’s return don’t know a lot about the complexities of the current immigration discussion. They just know that their friend is unhappy and stuck in a country he scarcely knows. They’re planning a trip to Washington D.C. to lobby congress for his return. Standing at the public microphone at the Campaign for Citizenship forum, Rodrigo’s classmate Kyle Kuwahara, nine, read a letter he wrote to President Barack Obama. It’s a shame for this young man and his family but where do we draw the line. Many people over stay their visas and do so on purpose with hopes that the laws will change and people will be granted mas amnesty as President Reagan did back in the 80’s. We need reform and a strong border. The children in the 4th grade should also be taught that we have laws in this country that need to be followed. Do you think his parents knew they were here on expired visas? They have to pay the penalty. As for Mireya Chavirri, who has been here for 16 years and paid taxes which I have my doubts. If they paid taxes how did they get a social security number…? AND 16 years and you still need an interpreter. Shame you are missing your dying mother but YOU choose your immigration status when you came her illegally. The road filled with pain was your choice.